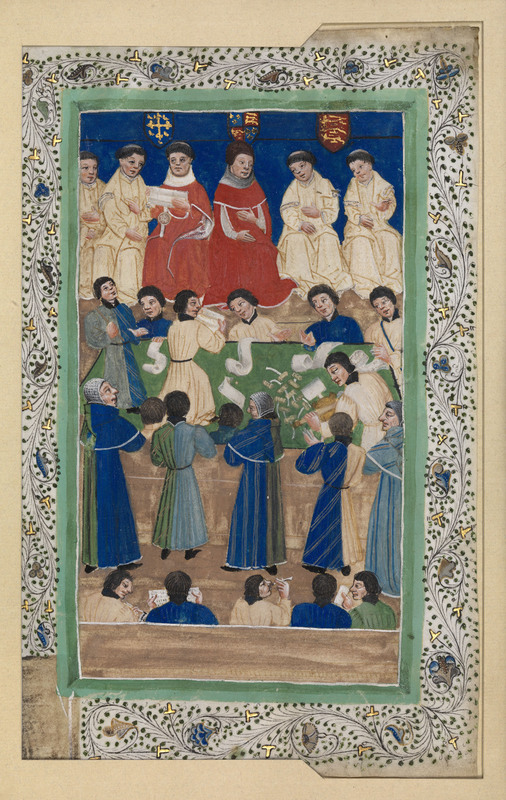 Illuminated manuscript, Court of Chancery (c. 1460). In the early years of the 20th century the Library acquired by gift one of its most valuable and historically important manuscripts. This was a set of four fifteenth century illuminations on vellum which provide the earliest known depictions of the English courts and court dress. They date from about 1460 and show the four courts at Westminster Hall – the courts of Chancery, Common Pleas, Exchequer and King’s Bench. The illuminations were presented to the Inn by Lord Darling (Treasurer 1914-1915), who had purchased them at Christie’s in 1894. The Library tower before the air raid, 1940. Between 1941 and 1942 the Library was destroyed by a succession of enemy air raids. The Benchers of the day in 1939 had declined to agree to the removal of any printed books though the manuscripts were taken out of London to safety. It was not until after severe damage was done to the building and several thousand volumes destroyed that the order was given to evacuate the Library, leaving sufficient ‘day to day’ books to carry on with. From September 1941 until the final destruction in 1942 books were blown off the shelves while windows, originally of glass, now of linoleum substitute, were blown in daily. The roof was burnt off, rain and snow had to be contended with, while books that were frozen hard to the shelves had to be levered off with iron bars. By May 1941 approximately half the book stock had been moved to a dozen country houses. The remainder of the stock was destroyed by fire on May 10th, 1941. Among material lost was the John Austin collection of Jurisprudence, presented by his wife after his death. It consisted of one hundred and thirty three volumes, of which thirty volumes had MS notes in his hand. All vanished. The catalogue and shelf lists were saved but the subject index was not. All the records of the Library up to 1940: correspondence, memoranda and reports together with the Librarian’s files were burnt. The loss of buildings and facilities was costly but these could in time be replaced. The loss in books was tragic, for much that was destroyed was irreplaceable and the task of restoration was not to be accomplished within thirty years. 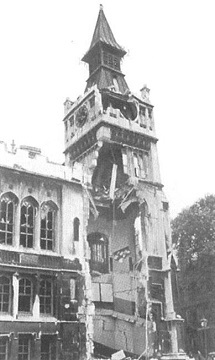 The Library tower after the air raid, 10th September 1940. In 1942 the Library commenced operating again in four rooms in No. 2 King’s Bench Walk with a stock consisting of borrowed and hastily purchased books. This accommodation was extended in 1949 and meanwhile a new Library was being planned for construction on the site of the pre-war building. The Times architectural correspondent, stressing the integrity of the design of the whole complex, observed that “the juxtaposition of the Inner Temple Hall, Library, and Parliament Chamber, and the thorough destruction of all three, have presented [the architect] with the one opportunity of large-scale replanning the Temple offers.” The Library was opened by The Treasurer, Sir Patrick Spens QC MP in April 1958, in the presence of a distinguished legal gathering which included Lord Kilmuir, the Lord Chancellor. By this time much of the lost essential legal material had been replaced through the generosity of members and friends. 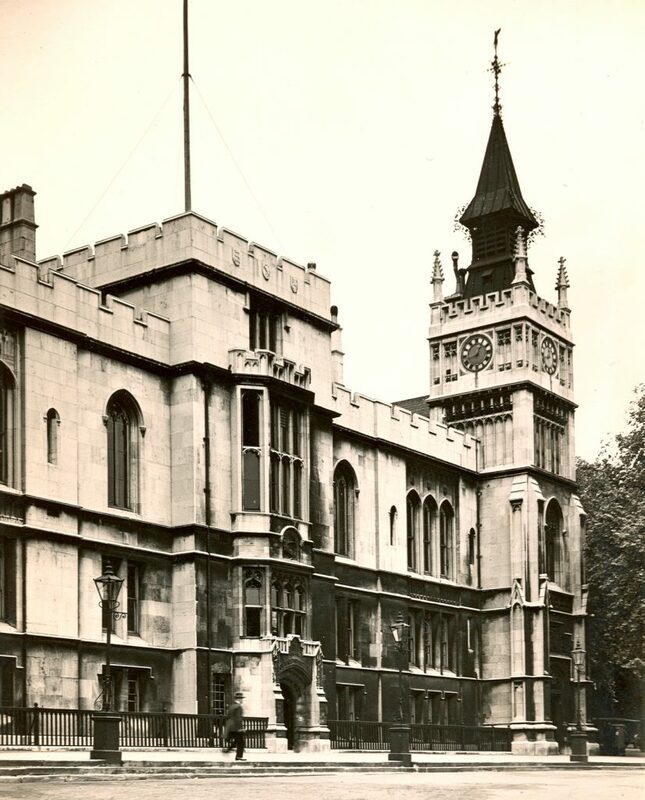 The present Library, designed by T W Sutcliffe, occupies two top floors above the Benchers’ private rooms and is built in the shape of an L, thus conforming roughly to the plan of the pre-war Library which it replaced. The main rooms housing the legal collections are in the long arm of the L, looking south over the garden to the river beyond, while galleries run round them at intermediate floor level. There are, in addition, a number of smaller rooms of different shapes and sizes. Built in a style stemming directly from the traditions of the late 17th – early 18th century, the Library is panelled throughout; the woodwork of the tables, book-cases, doors and balustrades being of natural, unstained English oak and the floors of sapele mahogany. A contrast in colour is provided by the chairs which are covered in blue leather. The books are shelved in cases that run, bay-fashion, around the walls, leaving the centre of each reading room clear for the siting of the readers’ desks. The bay windows on the south side contain single desks so that a reader may sit in solitude or in company as the preference takes him. Heating was supplied by oil-fired boilers throughout a succession of pipes concealed in the ceilings, while additional warmth is provided by radiators set in the recesses beneath the windows. Brass candelabra in the main rooms provide a general light, the bookcase bays have pendant globes to illuminate the various shelves and, in addition, each reading space is provided with its own table lamp. Other features are the pull-out flaps on the tables for the stacking of used books, and the very fine craftsmanship and design of the moulding on the pedimented doorways leading into the central room. Comfort-cooling was installed in the Library in 2001. The various MSS collections and the more valuable of the printed books are housed in a fire-proof strong room, leading off the Librarian’s office which commands the staircase approach to the Library. The recataloguing of the Library which was necessary as a result of the war-time losses was a major undertaking and was not completed until 1960. It took the form of a sheaf catalogue, with a supplement on cards which was maintained until the introduction of computerised cataloguing in 1991. With the initial recataloguing of the bookstock completed, attention was turned in 1960 to the cataloguing of the manuscript collection. Dr James Conway Davies was invited by the Masters of the Bench in 1960 to compile for publication a detailed catalogue of all five of the manuscript collections – the Petyt Manuscripts, the Barrington Manuscripts, the Records of the Inner Temple, the Mitford Legal Manuscripts, and the Miscellaneous Manuscripts. Conway Davies was a retired academic, some time Reader and Head of the Department of Palaeography and Diplomatic in the University of Durham. The resulting work, entitled Catalogue of Manuscripts in the Library of the Honourable Society of the Inner Temple, was published by Oxford University Press in three volumes in 1972, though Dr Davies had died in the previous year, while in the final stages of its preparation. In December 1976 agreement was reached between the Inn and World Microfilms Publications Ltd for the publication of the whole manuscript collection in a microfilm edition. The results were published on 256 reels of microfilm in 1978. In the new post-war building the Library occupied not only the two upper floors but also the basement, in which older and less frequently used material was stored, at first in fixed metal shelving, replaced in the 1960s by compact mobile shelving units. In 1991 it was decided by the Inn that the basement should be converted for use as a student common room and bar. The Library would in due course have additional space in the basement of a new building but in the meantime the older legal material, together with the non-law collections then housed in the gallery (the history, biography, heraldry, genealogy, topography and literature collections), was sent into storage. The return of the stored books, to their new home in what had by now been officially named the Littleton Building, was completed in 1997. Perhaps the most important development of recent years has been automation. Since its introduction in 1991, information technology has taken on an ever more important role in the Library. Users can now access the online catalogues of all four Inns of Court as well as a variety of legal databases via the Internet. The Library has had its own website since 1997 and Library staff also maintain a gateway site, AccessToLaw, which provides annotated links to free legal and parliamentary websites. In 2007 the Library launched a selective Current Awareness blog, which provides up-to-date information on new case law, changes in legislation and legal news. Users can subscribe to the blog via RSS feed or email or follow the blog on Twitter. Other developments include an electronic newsletter, legal research FAQs online and a virtual tour. The Library has also created a Facebook page to promote its services and as an additional way of communicating more directly with users. Some of these initiatives led to the Library team winning a Halsbury Award for Best Legal Information Service (Non Commercial Sector) in October 2007. The team also won the BIALL Wallace Breem Award 2012 for its “considerable contribution to the legal information profession”. More than 500 years since its inception, the Library (with a staff of nine) still provides and develops services to meet the needs of its two main categories of user: members of the Bar and the judiciary, and student members studying for the Bar examinations. It offers users access to a wide range of print and electronic resources in a comfortable and quiet working environment, with over 90 reader places. 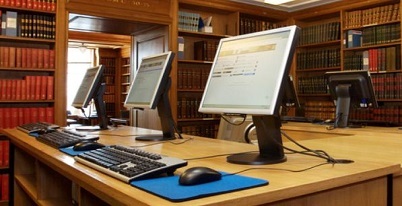 This includes a reference library of 70,000 volumes, the most up-to-date editions of major practitioner texts; a comprehensive archive of old editions of practitioners’ works; specialist Commonwealth and Scottish collections; as well as 22 PCs with access to free and subscription-based legal web services and Wi-Fi access for use with readers’ own devices. Within this deceptively tranquil setting of book-lined shelves and oak panelled walls it aims to offer a service which combines traditional sources with new technology for the benefit of its readers. All images are Copyright © the Inner Temple, unless otherwise stated.